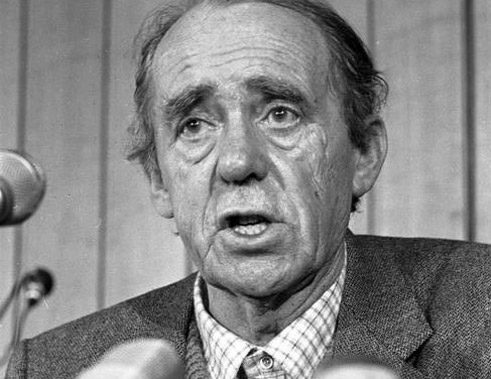 Nobel-prize laureate Heinrich Böll, who died in 1985, advocated the concept of the enlightened, responsibly-minded citizen – yet was often derided. In July 2015 thirty years will have passed during which one of the most important German-language writers has been missing from the literary scene: Heinrich Böll. He was born in Cologne in 1917 and was one of the generation of war veterans, writers of the zero hour and opponents of the Vietnam War and of nuclear warfare. He was also a critic of authority and a pacifist. Hardly any other German-language author received as much recognition in his lifetime. In 1972 he was awarded the Nobel Prize. His greatest literary success, the story entitled The Lost Honour of Katharina Blum (1974) sold six million copies in Germany alone. Böll repeatedly succeeded in taking up and filtering out themes that were in the air, so to speak. His literary subjects almost all continue to have an uncanny relevance to this very day: for example, The Lost Honour of Katharina Blum describes the persecution of a young woman by the media. Ultimately the mercilessness of the sensationalist press forces the protagonist to commit an act of despair. Today the Newspaper, as Böll calls his fictional tabloid, alluding to Germany’s Bild Zeitung, would possibly be a digital medium, perhaps even Facebook. In his novel The Safety Net (1979) Böll engaged with a burgeoning network of surveillance. The occasion for this particular theme was the all-encompassing hysteria in the face of the terrorism of the extreme left-wing Red Army Fraktion (RAF). That highly topical and oppressive book outlines the attempted destruction of a family by “state security and surveillance measures”. The author knew what he was writing about: he himself was under police surveillance, had to suffer house searches and was the victim of a smear campaign. Although Böll distanced himself clearly from the methods and aims of the RAF, he was declared, even in the German Bundestag, to be an ideological accomplice of the terrorists. The only ones to defend him were Willy Brandt and several other member of the SPD party and of the liberal FDP party. Böll’s major themes were the war and the post-war period: novels like And Never Said a Word (1953), House without Guardians (1954) or Billiards at Half-past Nine (1959) deal with the very tentative reappraisal of the theme of National Socialism in the 1950s. Böll was from a Catholic family and was critical of the NS-regime from the very start. While Günter Grass, who was ten years younger than him, volunteered to join the Waffen SS, Böll tried to avoid military service, initially writing applications for exemption so as to be able to study and later even feigning illness or forging leave passes. Scarcely any other author provides so much information about the reality of post-war life in the Federal Republic of Germany, the outcome and aftermath of the Second World War. He typically focussed not on the grand figures or heroes, but on “ordinary people” whose lives he chose to highlight. Böll’s touching and colourful stories about families torn between enthusiastic Nazis and Nazi-critics are more informative and better than many of the various other books published on this over the past decades. It was not just through his writings that Böll exerted an influence. He was also a politically active author and contemporary citizen, in the sense of an enlightened responsibly-minded citoyen. His commitment to Willy Brandt and his Ostpolitik towards East Germany, his support for persecuted writers and advocacy of humane treatment for the German terrorists were widely talked about. He also incurred people’s anger for not binding himself to a particular political party. He was close to Willy Brandt, but was not a member of the SPD, unlike Grass. He may have taken a stand on concrete political issues, but he did not want to be monopolized by anyone. Over the past decades, Böll’s social and environmental involvement have often be derided, with some writers and literary critics even presenting him as a naïve “do-gooder”. However, since new centres of conflict have flared up, even within Europe or on its border, things have changed. Böll’s commitment is no longer regarded as “outmoded”, but as exemplary. Now many young authors and artists are again commenting on political events. Yet a public figure like Böll no longer exists. He was one of the few great thinkers in Germany who did not take themselves too seriously. Tanja Dückers is a writer and journalist who lives in Berlin.